I'm kind of a sucker for anything in miniature, so when I saw these teeny tiny little feathers at the craft store for a mere $2.00 I knew they had to be mine. I like working with craft feathers - I have approximately one million feather headbands to add to my Etsy shop once I finally get around to it and I'm working on perfecting a hot pink feather bow tie (to save the world), but I've never seen or worked with mini feathers. I thought they were basically begging to get hacked up and turned into a necklace so I granted their final wish by doing just that. I'm really generous when it comes to stuff like that. First things first: trim the tail ends off all of your feathers so that only a little nub is left. Next, slide a crimp bead over that nub at the feather's end. It should fit pretty snugly. Once it's on, place the straight end of a eye pin through the crimp bead and down the back of the feather (see second picture below). Next we'll be crimping the crimp bead (hey, wait a minute...). If you've never worked with crimp beads you might be thinking they're kind of weird or maybe have something to do with regrettable hair choices of our youth, and you'd be half right - they are kind of weird. Basically, crimp beads are small, soft tube-shaped beads which are squeezed/crimped to secure other jewelry notions. A lot of people use them to secure clasps on wire jewelry like this. I've mostly used them to attach eye pins to nontraditional jewelry supplies, like feathers. The purpose here is to make the eye pin stay secure on the feather so that the eye pin can be attached to a chain to form a necklace. Make sense? So, back to the crimping. I'm using a crimping tool, which has two notches in its head because this is a two-step process. First, you use the notch furthest from the tip of the tool, which has a dimple in it that crimps the bead into a shape that resembles a capital 'B' laying on its back. Next, use the other notch to crimp the flattened bead back into a tube shape by bringing the lumps in the 'B' toward each other. I promise this is WAY less complicated than it may seem. You can read more about the process here. This is the second notch in action - making the flat-ish shape a tube-ish shape again. When that's done, use the wire cutters to trim off any part of the eye pin that is hanging outside of the crimp bead (except the actual 'eye' portion, which we need!). Repeat your newly acquired crimping skills on the rest of your feathers. You're almost there! Use the pliers to attach a mini jump ring to an eye pin. Then, attach the jump ring directly to the chain wherever you see fit, and close the jump ring. I counted out chain links to space them evenly and worked in a rainbow color pattern, but feel free to get all willy nilly up in this necklace. 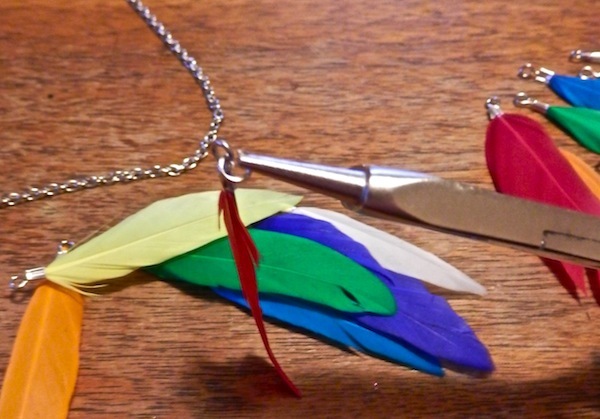 I don't think there are any rules about how to rock a rainbow feather necklace, nor should there be. Once all of your feathers are attached, simply link a large jump ring to each end of the chain and attach the clasp. This 'Party-In-a-Necklace' is fun and whimsical (ewww) to wear, and it will have a BLAST dancing around your face and neck if you wear it on a windy day. Or if you go running in it, which I can't recommend enough, as a potential witness and bystander. Are you into feathers? Have we all learned the difference between good crimping (beads) and bad crimping (any hair-do circa 1985-1991 and also occasionally in this century for some reason)? Oh my gosh, I LOVE this! So summery and bohemian! I've never tried my hand at jewelry, but this is begging to be tried :). Thanks! We'll have to agree to disagree, haha! This is so cute!! I love the feathers and colors!! Thanks - I'm in love with colorful feathers right now! cool idea, feather accessories are the trend lately! This is so colourful! I have to say, you're very talented! !